Learning Targets Who Needs Them? ISTE, NETS what are they all about? A few weeks ago I had never heard of ISTE or NETS. Standards, learning targets that’s all we’ve talked about the past few years at our school. We’ve spent a lot of time looking at various standards and then choosing to write our own most of the time. As department chairperson for the elementary division I have worked with our department on writing language arts and math grade level learning targets. We even wrote some learning targets for our Student Objectives that are listed on the elementary report card. Recently we revised our grade level bible learning targets. We still need to work on our grade level science and social studies learning targets. The technology learning targets were to be written by the technology department and taught by them too, right!?! Music, Art and Physical Education all worked that way. 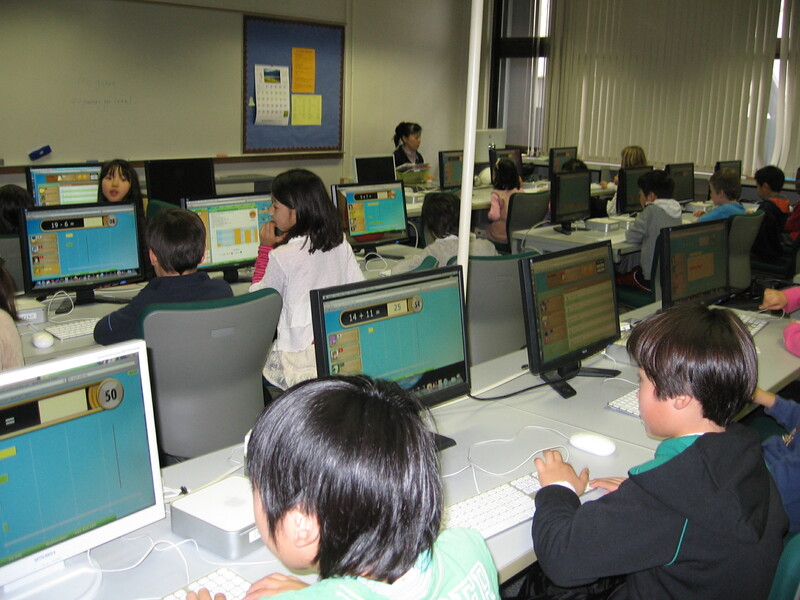 Elementary students in the computer lab. 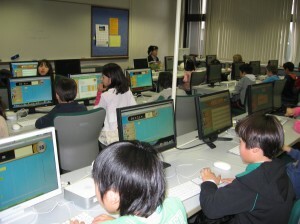 Until this year our elementary students went to “computer class” once a week. Standards and learning targets for technology were someone else’s job. 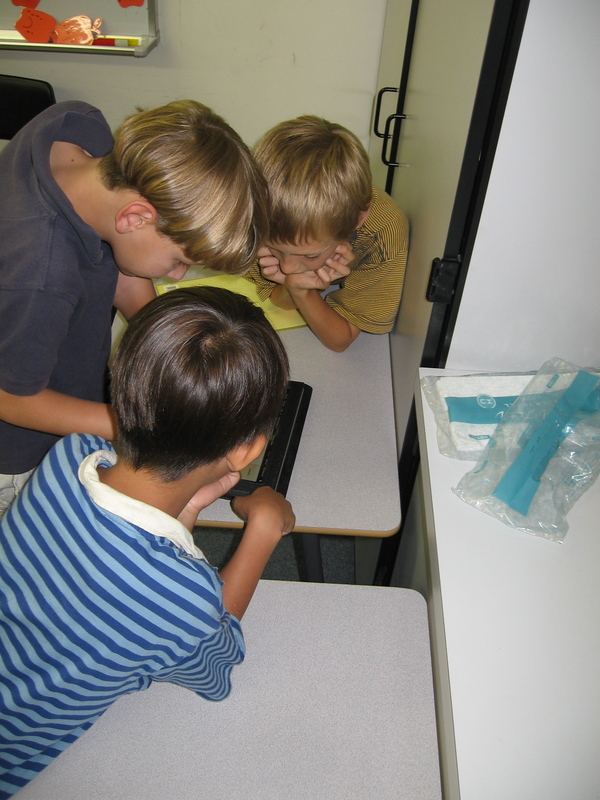 Last year the elementary principal talked to us about integrating technology into our classes. We were excited, I think, but really had no idea what we were getting into. In late spring, a good friend of mine, Vivian, mentioned the Coetail course to me. The elementary librarian at our school, Ruth had already been talking about attending. We were to get a “new” elementary technology facilitator, Grace so the two of us signed up too. I’ve tried to use technology in my classroom in the past, but I must admit that it has been mostly as a consumer. Students could “listen to reading” with Bookflix, Storyline Online, Raz-kids, practice math with IXL and World Math Day. Last year the students got very excited when they were able to use an iPad for “listening to reading” and practicing kanji in Japanese class. None of these programs are bad, but I’ve realized there is so much more to technology in the classroom. Practicing kanji in Japanese class. So, here we are 6 weeks into the Coetail course and about 6 weeks into the school year. Our goal in the elementary department at my school is to integrate technology into 3 units this year. What does that look like? What can/should we expect students be able to do? What are authentic assessments using technology? With no learning targets those are difficult questions. Our middle school has some technology standards and learning targets. They took NETS standards and rewrote them for our school. I like the standards they have written and they pretty closely follow NETS. Students create original digital products. 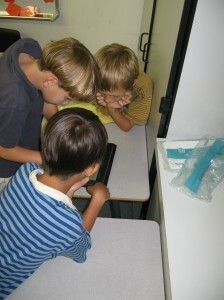 Students apply technology to collaborate and communicate. Students research efficiently and effectively using reliable online resources. Students apply problem-solving strategies to organize content and complete projects. Students address current ethical and societal issues in the use of technology by applying a Christian world-view. Students demonstrate fundamental skills related to operational systems, input methods and software applications. I understand these, but what do they mean in 2nd grade? How do I help the other classroom teachers decide what they mean in their classroom? When I looked at grade level learning targets for the middle school I didn’t see targets that students would necessarily carryover to other subjects. I saw a final project for a 9 week course. That’s not what I think NETS is about. Reading a lot of different pages and articles on the ISTE website has been a great help. NETS for Students 2007 has been informative, but even more so is the Students 2007 Profiles. I’ve come up with some learning targets for 2nd grade, but continue to refine and tweak them. I’ve shared them with our elementary technology facilitator and our principal I guess my next step will be to share them with the technology co-ordinator and other elementary teachers. Will they work? I’m not sure, but I think so. I’ve found it especially helpful to have some type of learning target as I work on my final project for the Coetail course. I’ve also found it easier to find units that I want to integrate technology with as I have learning targets that I can think about. I can think of authentic assessments that will show students have understood the content and can use technology to show that understanding. Should the NETS for Teachers be part of a teacher’s evaluation. Yes, but first of all teachers need training and then continued coaching in this area. Technology, Coaching and Community has very practical advice. I know that as I am learning new skills and have opportunity to try them with colleagues I feel more confident in using technology with my students. Does it always work out? No, but then there are non-technology lessons that also don’t work out. Can we learn together? Of course. One example of learning a new skill that I’ve been able to begin teaching my class about is blogging. We have a class blog. I’ve done most of the posting, but had the students each write about a photo and then I typed the text and posted the photos. I’ve assigned commenting as homework a few times and have had about half of the students and or parents respond. This is a new platform for parents, students and teachers at our school as an educational tool. As we all become more familiar with it I am looking forward to how we will all grow in our learning. Photos taken by me at CAJ in the 2010-2011 school year. This entry was posted in Coetail course 1, Digital Citizenship, ISTE, Learning, Standards. Bookmark the permalink. ← Where am I on Bloom’s Taxonomy? I LOVE that your moving away from consuming to creating, it’s great that you can evaluate this for yourself and have decided to focus on it. I strongly agree that the NETS for Teachers should be part of a teacher’s evaluation. Does your school have plans to use the standards? If not, how do you make that happen? Any ideas? Hiromi, I really don’t know if the school plans to use them. I guess I can start by talking to my principal who can take it to the leadership team. I doubt it will happen very quickly but at least they can begin to think about it adding it to our self-evaluations. As I read your blog about NETs, I could totally feel your pain. For the past six years in the technology department we have reviewed the NETs. I was very disappointed that ISTE wouldn’t let us use their technology standards in our curriculum maps without paying $25 a year for the privilege. That is why we had to write our own. The problem is basically there are only so many ways of to say exactly the same thing. That is why our standards still resemble the NETs but not exactly. We were told that if we had adopted the standards six years ago, we could have used them, but we were too late to adopt them now. It was all very confusing to me, but we just had to move on and do the best that we could in our situation. I am looking forward to the day when we can say we actually HAVE learning targets for every grade level for technology that we can all agree on and live with sometime in the next year or two. It has definitely taken far too long in my opinion! Developing, writing, uploading and using learning targets is a process. It will be great to have them for every grade level, but something done well will take time and the technology ones will take time, especially since this is the 1st year we are integrating into the classroom. But I’m excited about all that is happening and know the learning targets will happen also. This is great to read. One of the things I love about the learning curve that seems to be recurring is that people typically move from the stuff of integrating IT as the focus (so well termed consumer in your article”) to a much more contextual and organic use of learning tools that use the technology but aren’t about it. Since you mentioned parents, I wonder what the biggest hurdles have been for you or others you know helping parents work with new technologies. I think one of the hurdles is having parents who don’t seem to trust their kids to let them use their computer. We’ve had students at various grade levels say that their parents won’t let them touch the computer at home. But, on the other hand we have some parents who have no idea what their child is doing on the computer. Kids in 2nd grade last year were setting up their own email accounts. I got invitations from 5/6th graders to join Zorpia! Letting the computer be a babysitter isn’t any better than the “no touch” policy. I also have begun to wonder about parents who post everything their child does along with lots of personal family information. Parents who “share” on Facebook things that would be better discussed privately. How do we help parents think about digital citizenship? I guess the best way is to educate the kids and hope the kids will share with the parents what they are learning about appropriate and inappropriate postings.